We live in exciting times where robots and Artificial Intelligence are quickly finding their way into our societies. These emerging technologies promise to have huge transformative effects to many sectors. However, their potential is accompanied by risks for human safety, dignity, privacy and autonomy. So far, only a few governments and parliaments are starting to gather information and endeavour to develop regulatory frameworks. The European Parliament’s own-initiative report on Civil law rules on robotics demonstrates how this issue entered the political arena. Our conference at CeBIT is a venue for dialog between policy makers, practitioners, academics and ethics experts. We are delighted to welcome the leading researcher in the field of AI Toby Walsh for the keynote address. Chief News Anchor at DW News Brent Goff will guide us through three panels where leading speakers will discuss the opportunities and challenges for Europe in the context of robotics and AI. 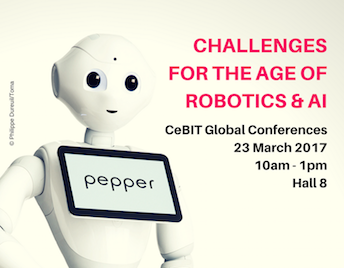 In an open discussion our speakers will share their special insights, including demos of robotics applications. Short and powerful talks will leave time for questions and answers of the audience. We raffle 150 FREE TICKETS to CeBIT! To win send an email to jan.albrecht [at]europarl.europa.eu with the subject „CeBIT Ticket“.